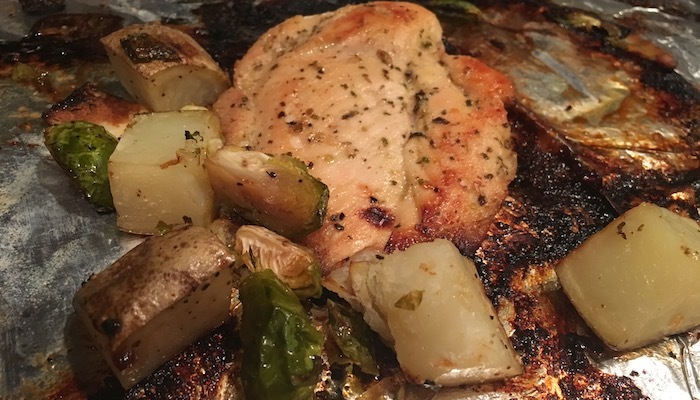 I am a really REALLY big fan of one dish meals – in fact a recent Christmas present was a cookbook of one-pan dinners – from slow cookers to sheet trays and dutch ovens. Really great for weeknight meals and easy clean up when you’re not really into doing a bunch of dishes. This chicken veggie tray bake recipe if definitely one to put in your repertoire. I generally get 2 chicken breasts and butterfly into thinner pieces – they cook faster and it’s more of a realistic portion size. You can do fresh green beans, cauliflower or broccoli if you want in place of the Brussels sprouts – we like Brussels sprouts though. I also use russet potatoes, but halved baby reds work too… really this chicken veggie tray bake recipe can be whatever you have in the fridge. If you use broccoli or cauliflower, add it in the last 15-20 minutes of cooking because they cook faster than Brussels sprouts do. They key to the veggies is to be sure they’re uniform size! Preheat oven to 400 degrees, line large baking pan with foil and wipe down with olive oil or spray with non-stick spray. In a small mixing bowl combine 2 Tbsp olive oil, butter, honey, brown sugar, dijon mustard, garlic, basil, and oregano - then taste & season w/ salt and pepper as needed. Place in oven and roast until the chicken is completely cooked through and the potatoes are roasted and done. When everything is done, turn on the broiler and roast the top for 2-3 minutes to crisp the veggies and chicken.